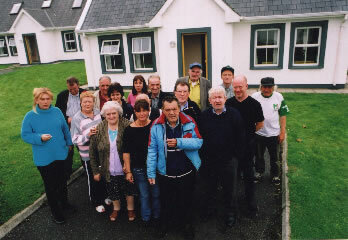 In September 2003, Aisling brought 30 long-term emigrants to Schull in West Cork. The following is an account of some of the adventures we had. Corkery’s bar is on the high street in Killarney. It stands proudly as the last of the old pub/groceries in the town. It is a pleasure to make your way through the shop at the front past the sacks of grain, boxes of fruit and veg and stacks of tinned food. In the back is the snug little bar where Tadgh Corkery holds court. We were in Killarney to meet Gerry’s brother who worked in the local branch of the Bank of Ireland. He didn’t know we were coming as Gerry had only made up his mind to go at the last minute and he had thoughtlessly got himself transferred to Killorglin a couple of years earlier. 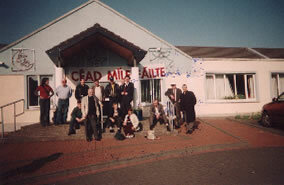 We contacted the branch in Killorglin and he would meet us later. I had another reason to be in Corkery’s that day. For many years I had tried to persuade Denis, one of the long-time residents of Arlington House to come with us to Ireland. Apart from a trip to Dublin to watch a gaelic football semi-final in the mid-eighties he had not been back for over 40 years. Denis is from north Kerry and he always said that he had no family and nothing to go back for but had said to me a few times that he would like to go into Corkery’s in Killarney for a pint. This year he had agreed to come with us to West Cork and I had promised to take him to Corkery’s for that pint. On the day we were leaving Denis was nowhere to be seen and as everyone was loading up I went to look for him to no avail. We were losing time and we eventually we had to leave without Denis. 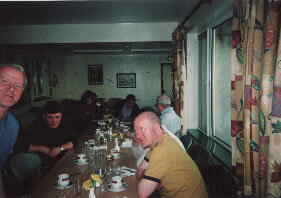 So when we were in Kllarney I was determined to find out what Denis’s connection was with the pub. I spoke to Tadgh Corkery asking did he know anyone by Denis’s name and he said that no-one by that name had ever been in his pub. I replied that this was probably in the 60’s or even the 50’s how could he be so sure? But Tadgh was adamant, no-one, customer or barman, by that name had ever been in his pub. He was very sure so I didn’t press the point and he certainly seemed to know his customers. A short while later after Gerry’s brother had arrived and they were having a happy reunion Tadgh came back to me, ‘could his name have been Damien?’ Well I supposed that it could, in fact he always signed his name with two D’s. I described Denis as I knew him today and Tadgh kept nodding. When I mentioned his big ears he slapped the table, ‘that’s him, tell me this does he follow gaelic games?’ I told him that he did, fanatically, and that he was a member of the London county club in Ruislip. ‘That must be him. That must be Damer’. ‘So who is he’ I asked. ‘My first cousin’ said Tadgh. If we were right he had lost contact with the family 40 years ago and they had been searching for him ever since. Far from having no family there was an extended family including twin brothers in Canada. I left details of Arlington House and hoped for a happy resolution. I hoped too that I was doing the right thing. Sometimes people want to drop out of sight for seemingly the smallest reasons. Sometimes they are so sensitive to their past and what was done or undone, said and unsaid way back when, that they jealously guard their anonymity and sometimes you can cause all sorts of problems by trying to do someone a favour. This was in my mind in Killarney but on the other hand sometimes you have to help nature take its course – give it a bit of a push now and then. I hoped that this would be the case with Denis. Cornelius wanted to visit his family near to where we were staying in Cork. He had been referred to John, who is a community alcohol worker in NW London by the local police, who thought that a return to Ireland would help him to recover from his chaotic drinking. Cornelius started drinking on the ferry going to Cork and as it is a long crossing he became very drunk. The stewards even had words with us and we tried to talk to him a bout it. He was in no mood to listed and by the time we arrived at the cottages he was on a bender. He met up with his grown up son and daughter and who did their best o control his drinking but as the week went on we caught sight of him falling in and out of pubs in the village. On a couple of occasions John would manage to talk to him and persuade Cornelius to slow down his drinking and he would nod and listen for a while. He knew that he was only upsetting and alienating his family but he would go off again, shopkeepers and publicans would tell us of his progress. His mother was ill and confined to bed and we were told that he did get to meet her but whether it was a sober or satisfactory experience for either of them we don’t know. We do know that his son brought Cornelius to the cottages as we were leaving and stayed with him until we departed, making sure that Cornelius left with us. What was going through his head for that week? Was he afraid to meet the family he had left without a drink I him? Was it a macho display masking his own hurt? Did he have any awareness of the damage he was doing? It was one of those few occasions in Aisling’s history when a return to Ireland was a negative experience. Or so we think now. 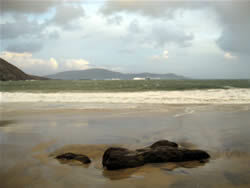 Otherwise we had a very successful trip to West Cork, one of the most beautiful and historic parts of Ireland. We visited Kinsale and Beal na Bleath where Michael Collins was shot and as we ate our picnic at the monument Sean Roche cycled past and waved to us. 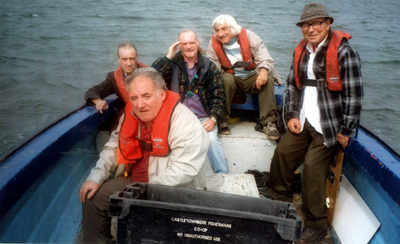 A good friend of Aisling from Passage West outside Cork City, had arranged for her father to take some of the lads out fishing in his small boat one day. 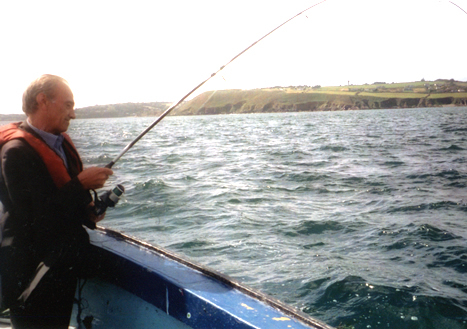 Billy and Tom had been out on the small pier at Schull every day fishing with a rod a and tackle but without any success, possibly due to the two herons, a cormorant and a seal that were also fishing there. 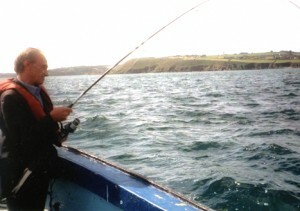 So on the day they went out with Jerry O’ Callaghan and three of the other lads, they were itching to catch some fish. It was mackerel season and they landed about 15 fish each which we ate with relish that evening (and for the next three days). Billy and Tom are regular street drinkers, sitting on the same bench in all weathers. During the summer Tom is always stripped to the waist but with a small pork-pie hat perched on his head. He is brown as a berry. And so Tom began the trip and so Tom remained – his manly girth on show for all to see. As with most of our returnees on this trip Billy and Tom slowed their drinking down considerably. By the time we were coming home a couple of cans of Guinness would get them through the day. And this was their own choice, there was drink there to be had if needed but it seems that the need was left behind in London. Pat was another who slowed down his drinking to almost full stop. He came to us from an alcohol recovery project in South-east London which had housed him in a flat in a smart new building. The other tenants were also recovering from alcohol dependency – some more so than others. The problem was with a neighbour who was using crack and who threatened, bullied and assaulted Pat on a regular basis. The neighbour is a woman and much younger than him and Pat couldn’t handle the situation and spent his time locked up in his flat drinking. It took a while for Pat to calm down, his nerves were shot with the drink and the abuse but he did settle down after a few days and by the end of the week he was virtually detoxed. He had to return to his flat after the trip but now he had some support and has plans to resettle in Ireland if we can sort out some supported housing for him. Finally, I had a bit of an Aisling myself. Quite a few years ago a good friend of mine left London for the west of Ireland and I lost touch with him, remembering only that he settled somewhere in West Cork. Traveling back and forth from Schull we passed through Ballydehob, a picturesque little village with brightly painted houses, pubs and shops. One of the shops was Minihan’s and I wondered if my friend John had set up business here. One day on the way back from Cork I stopped and asked the woman in the shop is she knew John Minihan, she pointed up the lane to the side of the shop, ‘he lives in the blue house at the end. It’s a common enough name around here’. So we parked outside the blue house. John had just arrived back from Dublin and didn’t turn a hair when he saw me in the doorway, ‘Alex! Come in and have a cup of tea’. John is a gifted photographer, having learnt his trade at the London Evening Standard. 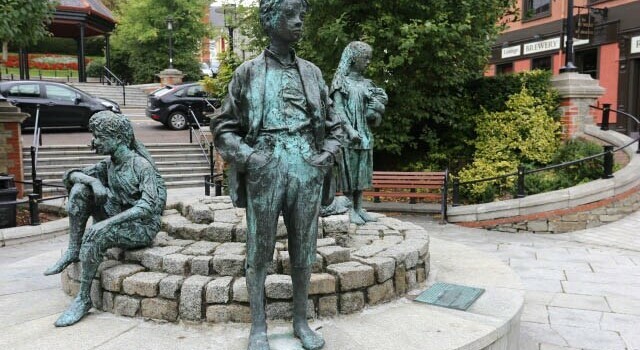 He became well known for his photographs of his hometown of Athy which he had been photographing every year since he was a boy, building up a huge social documentary of the town which became a book and an exhibition. He is also known for his pictures of Irish writers and artists – in particular Samuel Beckett who John befriended and he became one of the few photographers the reclusive Beckett would let anywhere near him. John came to visit us the next day before we left for home with bundles of clothes and books of his pictures. He enjoyed photographing the Aisling lads, their faces etched deep with the experience of lives hard lived, like Beckett the chronicler of the homeless and dispossessed.